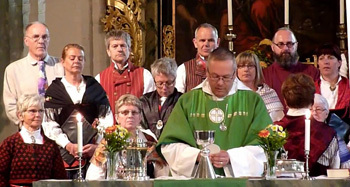 CP&S comment: We wish to make clear that in publishing this article on the unscrupulous ways the New Mass was thrust upon the faithful, in no way are we stating that the Novus Ordo Mass, when celebrated according to the rubrics set out by the CDF and in Canon Law, is an invalid Mass. The NOM is still the only available option for the majority of Catholics today. Nonetheless, its liturgy and form are undoubtedly severely lacking in many sacrificial aspects that were removed by team Bugnini, rendering it no comparison to the awesome Tridentine Mass, that had been the very centre of the Faith of the Catholic Church since the earliest centuries of Christendom. The angelical Bishop Francis of Sales has a right to a distinguished position near the Crib of Jesus, on account of the sweetness of his virtues, the childlike simplicity of his heart, and the humility and tenderness of his love. He comes with the lustre of his glorious conquests upon him — seventy-two thousand heretics converted to the Church by the ardour of his charity; an Order of holy servants of God, which he founded; and countless thousands of souls trained to piety by his prudent and persuasive words and writings. 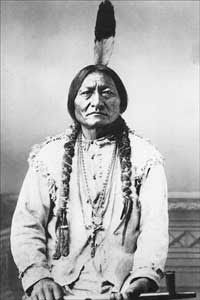 CP&S comment: Someinterest has been stirred, both on the blog and off it, on one of the examples of bad and biased journalism mentioned by Fr George Rutler in his ‘Weekly Column’ that we published yesterday, that of the large Crucifix worn by the Red Indian, Sitting Bull, until his dying day. The well known photo of this famous Indian chief was photoshopped to blot out the Crucifix! Such a powerful witness to the Saviour of Mankind and the instrument of our redemption could not be tolerated by the secular media, even over 100 years ago. Flagrant hostility to Christians by the MSM, and in particular to the Catholic Church, continues to grow increasingly worse in our day. Here is an account of the background to this story by Catholicblogger, Dr Taylor Marshall. The glorious choir of Martyrs, that stands round our Emmanuel, till the day of his Presentation in the Temple, opens its ranks, from time to time, to give admission to the Confessors, whom divine Providence has willed should grace the Cycle, during this sacred season. The Martyrs surpass all the other Saints in number; but, still, the Confessors are well represented. After Hilary, Paul, Maurus, and Antony, comes Raymund of Pennafort, one of the glories of the Order of St. Dominic and of the Church, in the 13th century. Source: Should a Priest Introduce the Usus Antiquior to a Congregation That Doesn’t Request It? Whatever you make of Milo Yiannopoulos, in this riveting interview with Michael Voris, the controversial author of “Make the Vatican straight again” tackles various topics including politics, Pope Francis and the homosexual crisis in the Church as well as his own personal problems and struggles. Towards the end of the conversation, Voris rather movingly promises to pray for Milo that by God’s grace he will fully overcome his demons and become holy. Whether you watch this lengthy interview or not, do please join in this prayer. On a memorable pilgrimage that I made with my mother to Lisieux in 1997 for the centenary of the death of St Thérèse, we also visited Alençon (birthplace of the Martin sisters) and Caen where Thérèse’s elder sister, Léonie, lived for over 40 years as a Vistatiin nun. We heard her hard story for the first time from the dear sisters at the convent there. They were all convinced that this gentle and prayerful member of their community, who had overcome so many difficulties to become a religious – most of all, that of conquering her own recalcitrant nature – was now a Saint in Heaven. 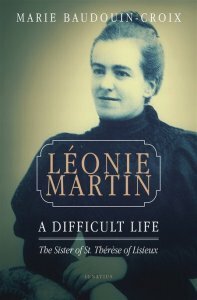 Since then the cause for Léonie’s beatification has been opened.